More than 70 years ago, psychologist Rene Spitz first described the detrimental effects of emotional neglect on children raised in institutions, and yet, today, over 7 million children are estimated to live in orphanages around the world. In many countries, particularly in Eastern Europe and Central Asia, the rate of institutionalization of poor, orphaned, and neglected children has actually increased in recent years, according to UNICEF. Meanwhile, evidence documenting the negative consequences of institutionalization on children’s minds and brains continues to mount. One of the most scientifically rigorous studies comparing the effects of orphanage versus home rearing is the Bucharest Early Intervention Project. Researchers randomly assigned orphaned Romanian infants and toddlers either to institutional care—which is the norm of care for orphaned children in Romania—or to high-quality foster parents who were thoroughly vetted and trained by the researchers. Because the children were drawn from the same population and randomly assigned to groups, any group differences in outcomes must logically be due to the different forms of care to which the children were assigned. Early studies from this research group focused on cognitive and emotional outcomes in children in the institutional versus family-based foster care setting. The children raised in family settings developed higher IQs than those who stayed in orphanages, an effect that held true over an eight-year follow-up period. Children placed in foster care subsequently had better language development than those who remained in orphanages. They exhibited more secure attachment to caregivers than those left behind in orphanages, and they developed fewer signs of emotional problems. Critically, for virtually all of the outcomes, the benefits of family care were realized primarily for those children who were placed in families before the age of two. Early placement in stable families is clearly better for children. Institutional rearing negatively impacts children’s biology, as consistently shown by studies from the Bucharest project. Children left in institutions have altered stress physiology, including abnormal stress-hormone responses during challenging tasks in a laboratory setting. Compared to children who were assigned to foster care, institutionalized children have more abnormalities in the white matter structure of the brain, which refers to the fiber pathways that facilitate communication between brain regions. They have blunted brain responses to pictures of faces. They exhibit atypical patterns of oscillatory activity in the electroencephalogram, the measurement of electrical activity in the brain. Even chromosomes inside the cells of the body are affected by institutionalization. Telomeres are protective portions on the ends of strands of DNA, and they are known to diminish with normal aging. High levels of chronic stress have been associated with greater diminishment of telomeres, suggesting that stress speeds aging at the cellular level. A study from the Bucharest project found that telomere shortening in Romanian children was directly related to the amount of time spent in an orphanage. The adversity of orphanage rearing leads to faster cellular aging. Some children are affected more than others by the social-emotional deprivation of institutional care, and researchers, child-welfare professionals, and parents have long wondered why. Although many factors are likely at play, some evidence suggests a contribution from genetics. Children who carry two copies of a particular gene (one that affects the brain’s serotonin neurotransmitter system) are differentially susceptible to the impact of early caregiving environments. These children both benefit more from family-home rearing and suffer more from institutional rearing, compared to children with other genotypes. For these “sensitive” children—whose genotype is fairly common in the general population—the caregiving environment has a particularly profound impact, pushing the children in either a positive or negative direction depending on whether the environment is enriching or depriving. Needless to say, we can’t change children’s genes, but there is at least a possibility of changing their environments. Given the extraordinary amount of evidence that institutionalization is damaging to children, why does it still happen? There is a startling disconnect between the scientific evidence and child welfare practices in many places in the world. Political and cultural concerns can trump science, as is the case in Russia, for example, which maintains an extensive system of state-run orphanages. Such institutions provide jobs and graft for bureaucrats and are therefore resistant to dismantling. Domestic adoption is culturally stigmatized in Russia, which has also banned most international adoption for nationalistic reasons. Little social support exists for raising children with disabilities, who face particularly heartbreaking conditions in orphanages. Russian families continue to feel the sting of a faltering economy as well as high rates of alcoholism and reduced life expectancy, undermining attempts to find adequate foster families or to support birth families so that children are not sent to institutions in the first place. Data indicate a disturbingly high rate of fostered and domestically adopted children being returned to orphanages in Russia. Elsewhere in Eastern Europe, such as in Romania and Ukraine, strides have been made to support domestic adoption, but cultural norms are difficult to change, and institutionalization persists. Sadly, unless some of these factors are addressed with urgency, marginalized children will carry the scars into the next generation. Rebecca Compton is Professor of Psychology at Haverford College. 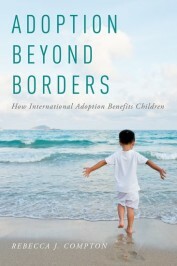 She has co-authored Cognitive Neuroscience, Third edition, and is the author of Adoption Beyond Borders: How International Adoption Benefits Children, published by Oxford University Press. They (HAUGE, countries, courts) make is so difficult to adopt. We asked about adopting a sibling group from a Latino country in 2007 and were told no for really no apparent reason. We kept on trying and trying. Finally in 2011 it was agreed we could pursue the adoption. Now in 2016 we have two of our boys home (as of 3 months ago), but we are still trying to get the oldest who is now 19 years old. I think of all the childhood our adopted children lost because of paperwork, paperwork and more legal paperwork. We didn’t need to prove ourselves as parents to have our biological children! I understand that children need to be protected, but considering the alternative of aging out of an orphanage with no family, they need to make adoption much easier. We as a world do not value children. If we do not value children, do we really value ourselves? What an enlightening and research-based article. It so strongly begs the question of why not more international adoptions, when we know that well-qualified and screened families are eager to adopt internationally. As an adoptive mom of 5 and someone who works w a supplement company specializing in telomere support. I find that this article is yet another example as to why adoptive families really need to be educated on helping to reverse decline from the stresses of orphanage living by seriously looking at an upgrade to diet. It seems to be the last thing we think about. My kids were rocking and had other orphanage behavior when they came home. With love and nutrient dense food and family support we’ve made great strides. But it saddens me to think of all the kids who will never have a chance in receiving the incredible therapy a family provides. This article is awesome! Thanks so much for sharing it with us! They have loving families that they were ripped from. Never to be returned. That is what is sad! I believe that the article should point to the need of adoption and the end of orphanages. There are well maintained orphanages that provide a stable home for children all over the world, while some run down foster homes provide instability, abuse and neglect as well. Blanket statements and without organizations to review institutions and foster homes, this will be a problem. I have worked with neglected children and seen what orphanages can provide for them. This article blog post is so informative and very on point with the facts. This reminds me of a 20/20 episode of Romanian orphanages aired in the 90’s. I recently came home from Romania and I can say that orphanage conditions have improved, but that should not stop people from making an effort to adopt children from countries like this (despite the difficult process). Although many orphanages can provide a good home for children, basic parental care is essential for proper brain development. I really enjoyed this research based article.